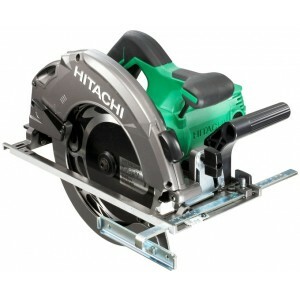 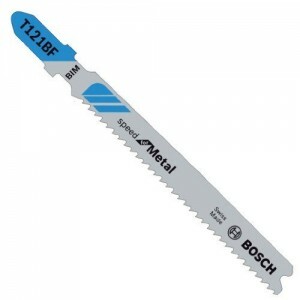 Bosch T118A Jigsaw Blades for metal cuttingBosch Jigsaw Blades for Metal cutting Bosch is the world-wide market leader for jig saw blades. 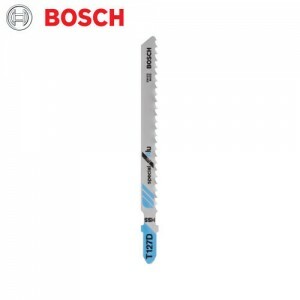 This means uncompromising quality, innovative ideas and universal use. 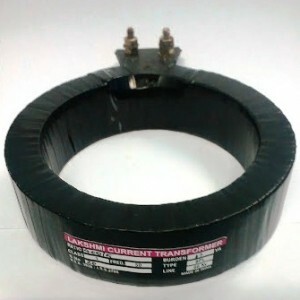 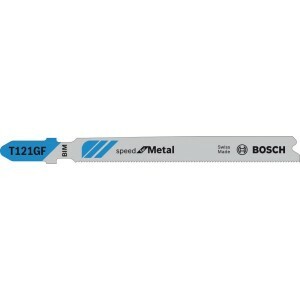 Bosch T-shank blades suitable fo..
Bosch T118B Jigsaw Blades for metal cuttingBosch Jigsaw Blades for Metal cutting Bosch is the world-wide market leader for jig saw blades. This means uncompromising quality, innovative ideas and universal use. 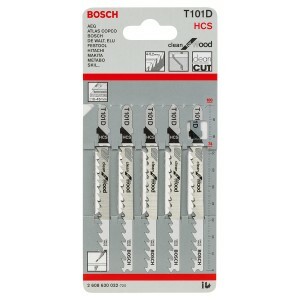 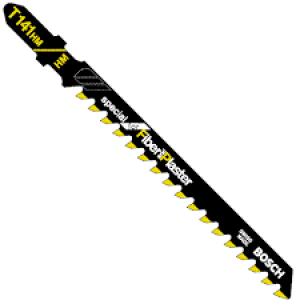 Bosch T-shank blades suitable fo..
Bosch T101D Jigsaw Blades for wood cutting*5pcsBosch is the world-wide market leader for jig saw blades.This means uncompromising quality, innovative ideas and universal use. 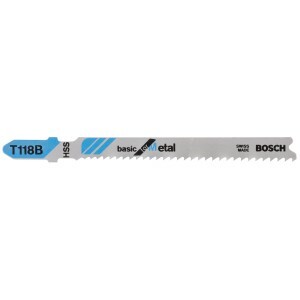 Whether for miter, straight or curved cuts, Bosch sells the right saw blade..
Bosch T127D Jigsaw Blades for Aluminum cuttingBosch is the world-wide market leader for jig saw blades.This means uncompromising quality, innovative ideas and universal use. 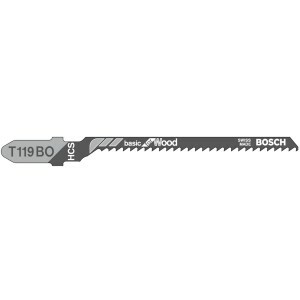 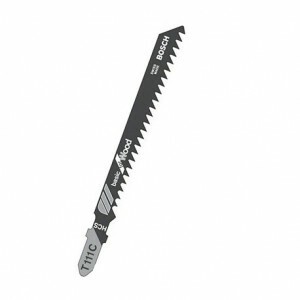 Bosch T-shank blades suitable for jig saws from Bosch, Skil, AEG, Dewal..
Bosch T111C Jigsaw Blades for WoodDetailsMaterial	HCSTooth design	side set, milledTotal length [mm]	100Tooth spacing [mm]	3Shank	Single lug shank (T shank)Areas of application	: Softwood (4-50 mm), chipboard, wood core plywood, fibre boards, qu..
Bosch T118AF Jigsaw BladeFlexible metal T118AFContent: 3x Flexible metal T118AFsingle lug shank ( T )Description :Bosch is a leading manufacturer of accessories for power tools and is the top supplier of jigsaw blades, hammer drill bits, chisels and ..
Bosch T119BO Jigsaw Blade for wood cutting Bosch Jigsaw Blades for wood cutting Bosch is the world-wide market leader for jig saw blades. 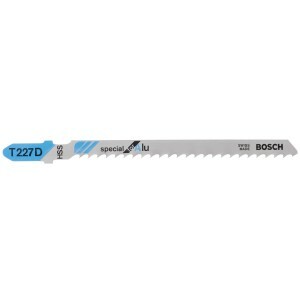 This means uncompromising quality, innovative ideas and universal use.Whether for miter, straight or curved c..
Bosch T227D Jigsaw Blades for AluminiumJigsaw blade T 227 DContent: 100x Jigsaw blade T 227 DSpecial for Alu (T227D), single lug shankDescription :Bosch is a leading manufacturer of accessories for power tools and is the top supplier of jigsaw blades..
Bosch T118AHM Jigsaw Blade*3pcs Features : Tungsten carbide tipped (bar) Ground For thin, stainless steel sheets (inox) 1.5-3 mm Straight cut, fine Long life Pack of 3 Specifications : Material : TC-tipped (bar) ..
Bosch T123x Jigsaw Blades for metal cuttingBosch Jigsaw Blades for Metal cutting Bosch is the world-wide market leader for jig saw blades. 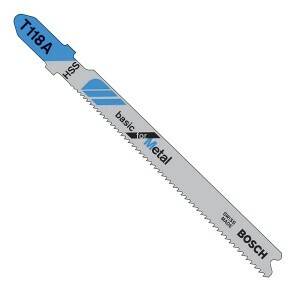 This means uncompromising quality, innovative ideas and universal use. 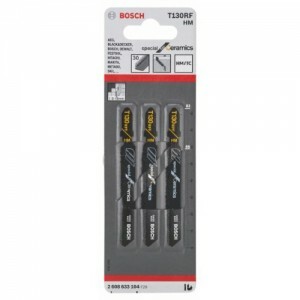 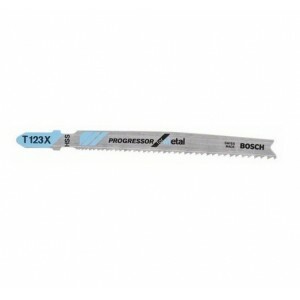 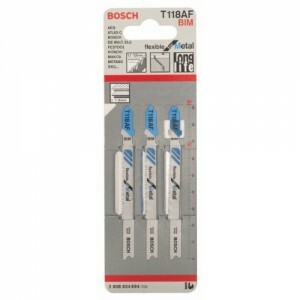 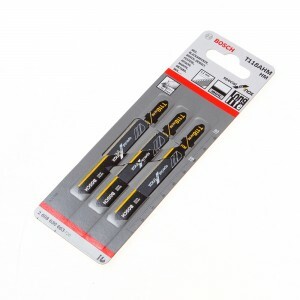 Bosch T-shank blades suitable fo..
Bosch T130RF Jigsaw blades For Ceramica*3pcsDescription : Bosch is a leading manufacturer of accessories for power tools and is an innovation leader with 125 years of tradition. 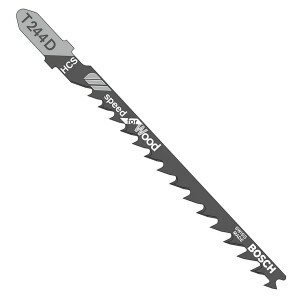 Bosch's aim is to develop innovative accessories for all applicati..
Bosch Jigsaw Blade T141HMGlass fibre reinforced plastics/Epoxy : 5-20 mm Material : TC-tipped Tooth design : side set Length of teeth [mm] : 74 Tooth spacing [mm] : 4,3 Shank : Single lug shank (T shank) Application: Special Areas of appl..
Bosch T121AF Jigsaw Blade*5pcsDescription : Material : BIMTooth Design : Wavy set, milledTotal Length : 92 mmTooth Spacing : 1.2 mmShank : Single Lug Shank (T-Shank)Areas of Application : Thin sheet metals (1-3 mm)Length of Teeth : 67 mmType :&..
Bosch T121BF Jigsaw Blade*5pcsDescription : Material : BIMTooth Design : Wavy set, milledTotal Length : 92 mmTooth Spacing : 2 mmShank : Single Lug Shank (T-Shank)Areas of Application : Medium-thick sheet metals (2.5-6 mm)Length of Teeth : 67 m..
Bosch T121GF Jigsaw Blade*5pcs ..
Bosch T244D Jigsaw Blades for wood cuttingThese high quality Jigsaw blades from bosch have side set ground teeth, and are designed for cutting softwood (5-50mm), chipboards, wood core plywood and fibre boardsFeatures and Benefits :Designed for use wi..